To pay your Water Bill on line. Have your credit card and bill handy and click on the faucet, or pay by automated phone by dialing 1-844-813-4737 and follow the prompts. On behalf of the citizens of Dardanelle, I extend a warm & caring welcome to newcomers to our city and the surrounding area. Dardanelle is a city of historic homes, giant trees and friendly people. 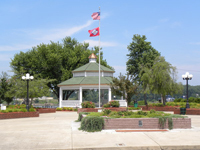 Located in the shadow of Mount Nebo and on the banks of the Arkansas River, Dardanelle lives up to its heritage as one of the original river ports when the early settlers arrived in the Arkansas River Valley. Just as in the early days, Dardanelle Rock and the Council Oak Trees welcomed travelers to our area, the city continues to invite new businesses and tourists to our city. Our school system is second to none with a high school curriculum designed to prepare graduates for higher educational opportunities. Dardanelle churches represent most major faiths and the ministers representing these churches work together to help make Dardanelle a better place to live for all ages. The area offers a wide variety of recreational opportunities – from hiking the scenic trails of Mount Nebo to fishing on Lake Dardanelle and hunting wild game in our forests and woodlands. Whether you are moving to the River Valley to bring up your children or to enjoy your retirement years, visit Dardanelle. If you need further assistance in locating services and opportunities, please call or visit our city hall on South Front Street (479-229-4500).